The Aldmeri Dominion is one of the three joinable factions participating in the Alliance War, the other two being the Daggerfall Covenant and the Ebonheart Pact. The crest of the Aldmeri Dominion is an eagle, and its colors are yellow and silver. It consists of the Altmer of Summerset Isles, the Bosmer of Valenwood, and the Khajiit of Elsweyr. The alliance is a nascent empire that rules its holdings with an iron fist. 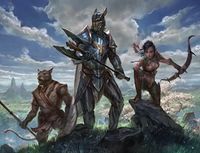 Led by Queen Ayrenn with Elden Root as its capital, the Dominion seeks to reestablish Elven dominance over Tamriel in order to protect it from the carelessness of the younger races. The province of Valenwood, led by King Camoran Aeradan, joined the alliance to help fight off the Colovian troops that were capturing territory in northern Valenwood, while Elsweyr still remains in the grip of the Knahaten Flu. Dominion players will begin on Khenarthi's Roost after being washed up unconscious on the shores of the island following their escape from Molag Bal's realm of Coldharbour. The Aldmeri Dominion's home territory covers the traditional provinces of Summerset, Valenwood and Elsweyr. The Dominion also have a territorial claim over the southern and southwestern parts of the Imperial heartlands. 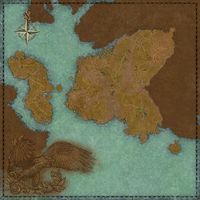 Aldmeri Territory — The southwestern region of Cyrodiil. Quests with this marker are required for Cadwell's Almanac. For a full list of Almanac objectives, including any required side quests, please see Cadwell's Almanac: Aldmeri Dominion. To Auridon: Travel to Auridon. To Mathiisen: Seek out Razum-dar near Mathiisen. To Skywatch: Meet Razum-dar in Skywatch. These quests serve to point you away from a location which the storyline has not yet reached. They are no longer available once the quest they point to has been completed, and will not be encountered if you follow the story in the order listed above. All the Fuss: Report to a Watchman at Vulkhel Guard. Missive to the Queen: Report to a Watchman at Vulkhel Guard. Back to Skywatch: Gather some reinforcements for Firsthold. The Siege of Velyn Harbor: Help defend the Dominion's lifeline to Malabal Tor. The Hound's Plan: Search the Xylo River Basin and try to uncover the Hound's intentions. The Dark Mane: Search for Mane Akkhuz-ri in Reaper's March. Hallowed To Arenthia: Travel to Arenthia to aid its inhabitants. To Rawl'kha: Head into the Jodewood with news of the Mane. Moons Over Grimwatch: Heed the Moons' call to aid the Lunar Champions at Grimwatch. Eye on Arenthia: Meet the Eyes of the Queen at Arenthia. Hallowed To Grimwatch: Travel to Grimwatch to aid the Lunar Champions. Hallowed to Rawl'kha: Begin your journey with the Lunar Champions in Rawl'kha. The Champions at Rawl'kha: Head into the Jodewood with the Lunar Champions. To Saifa in Rawl'kha: Follow the paths of moonlight to Rawl'kha. This page was last modified on 12 July 2018, at 16:19.